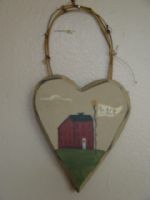 This chunky heart is designed and tolepainted by Heidi. Edges are chunked for a primitive look. Antiqued and completely sealed. Measures 5"x3.5" without grapevine hanger.